Positive sequence impedance are calculated assuming that there are no metallic elements that are placed within an influential distances of cable (Railway lines, pipe lines or buried equipment’s etc.). The presence of other metals or metallic objects influences the sequence impedance. Because of influence of other unknown factors, it is recommended that the impedance should be measured in the field after the circuits are installed. Positive and negative sequence impedance for cables is same value, because the impedance of these in uncharged if a symmetrical voltage system with reverse sequence is applied to them. Zero sequence impedance of the cable is not a fixed parameter and depends on the kind of transmission and electrical conductivity of the soil (environment). 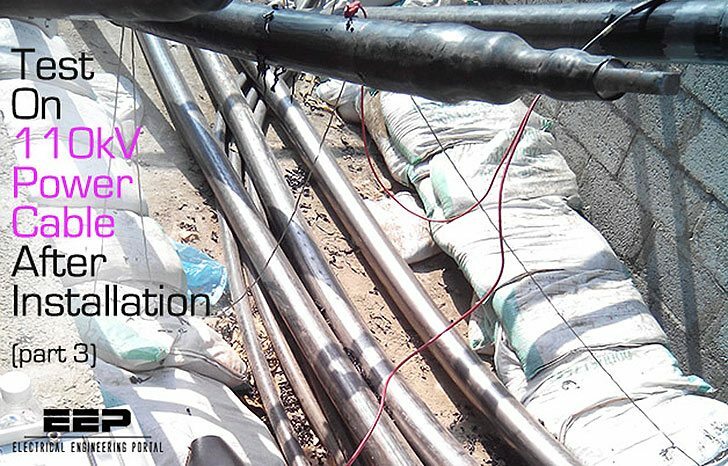 Measurements on installed cables have to be carried out, in order to obtain the exact value. Usually the zero sequence impedance can be assumed as 3 times the positive sequence impedance value as a practice for initial approximation. The three currents of zero sequence system, equal in magnitude and direction, are opposed by an impedance that is determined by the loops formed by the three cable cores and returned by the metallic sheaths and earth in parallel. The effective AC resistance of the zero sequence system includes both the effective resistance of the line conductor as well as that of earth return. The zero sequence impedance can be determined by measurement or calculation when the three phase of the system are connected in parallel and single phase AC current is applied to them. 3-phase variable transformer (up to 100 Amps supply capacity). Impedance measurement equipment – Digital. The measurement is done between two phases of the circuit once the complete circuit is installed, cable may be transposed and cross bonded between the terminations. There should be electric accessibility to the cable cores at terminations. The connections should be made as per Figure 1A. Turn up the power with the variable transformer until 25 Amps of current starts flowing. Switch the impedance measurement equipment and record the voltage, current and angle (power factor). Switch off after the measurement and turn the variable transformer down. The measurement is to be repeated three times: between R & Y, between R & B and between Y & B phases. 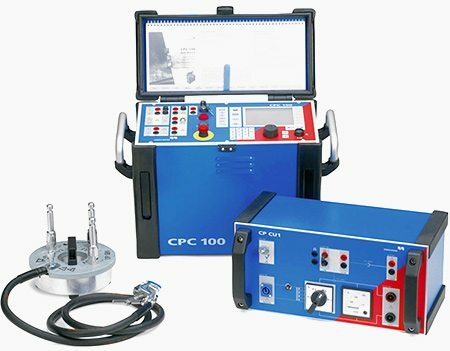 The measurement is done by connecting the three phases of circuit connected in parallel and a single phase AC voltage is applied to them. The connections should be made as per Figure 1B. Precautions: safety precautions should be taken prior to switching by putting up warning tapes and stationing personnel at critical point to ensure that no one is within reach of system parts where high current are applied. The measurement of earth resistance is mainly intended for the purpose of grounding the links of bonding system of high voltage cable screen. Analogue Earth tester Model-04102A, Make-KYORITSU. Check the battery voltage, set the range switch to battery check position and press test button and make sure the indicator is at right of BATT GOOD position. The connections as per the figure bellow. Check the earth voltage by setting switch to earth voltage position, make sure the voltage is 10V or less. If the earth voltage is higher, the result may be with excessive high errors. Measure the earth resistance by setting the switch to resistance range position and press test button. The earth resistance must not exceed 5Ω for outside substation and 3Ω for inside substation. This test is basically carried out after installation of link boxes and connecting leads. 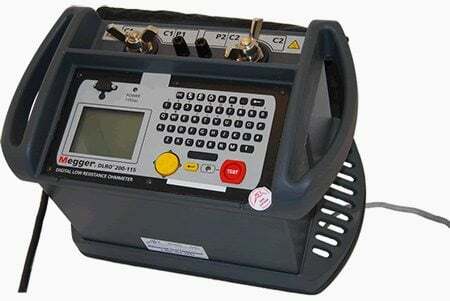 Connect the micro-ohmmeter with the link box as shown in figure below. 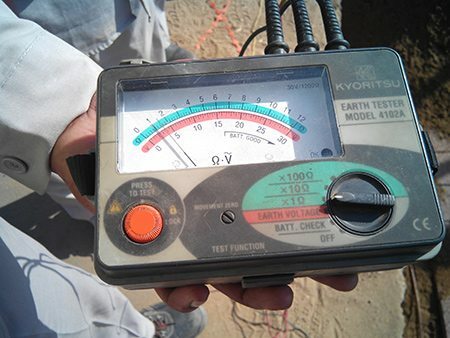 The micro-ohmmeter shall be applied between earth copper bar and each disconnect able copper bars. Test shall be repeated for individual connections. The values should bein micro-ohm range. Why we don’t do positive and zero sequence test of short length 110kV cables; means cables length less than 200 Mtrs. Thanks for your nice technical (Test On 110KV Power Cable after installation) presentation which is very fruitful for us. Now a days it is found – Test On 230KV Power Cable after installation follow a test called IMPEDENCE TEST by injecting 20 ….100KA current from a testing Set (like Voltage/ current Injection set/source) . Dear John, check the transposition and bonding. both should be in opposite direction like if one is in clock wise direction the other must be in Anti-clock wise direction for a major section. the only solution for this problem is alter the cross bonding but the common mistake in cross bonding is the position of bonding cable in link box. to avoid this follow the color of bonding cable( for example, which phase inner core is connected to outer phase). why we should apply DC voltage only ? DC voltage has Non-destructive nature and it doesn’t cause harmful or cumulative effects on insulation materials by providing a below voltage then the breakdown voltage of insulation. The IEC and other specifications are not really helpful because the conditions are allways for a pristine new cable under ambient temp and std humidit. Far away from the case in the field..
Dear Cosandey, its basic- just calculate the Insulation resistance of cable (R) by R= (ρ/2πl)*logₑ(d/D) where, l is length of cable, ρ is resistivity (mentioned in cable specification), d&D is inner and outer dia of cable insulation (XLPE), then find out the range of Leakage current by the v=IR equation. Do we need to applied DC H.V. on the 110kV cable?